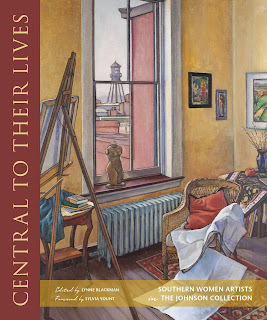 I’m thrilled to announce that my chapter, “Contrary Instincts: Art History’s Gendered Color Line,” was published in Central to Their Lives: Southern Women Artists in the Johnson Collection. This catalogue, years in the making, acknowledges the achievements of female artists working in and inspired by the American South. Spanning the decades between the late 1890s and early 1960s, the volume examines the complex challenges these artists faced in a traditionally conservative region during a period in which women’s social, cultural, and political roles were being redefined and reinterpreted. My essay looks at the mutual marginalization of trained and self-taught southern African American women artists. For Boston-born Loïs Mailou Jones (1905-1998), Clementine Hunter (1886-1988), and Minnie Evans (1892-1987), the challenges posed by their race were complicated by an additional barrier: their gender. As limited as the opportunities were for African American male artists, meaningful opportunities were even rarer for women. Trained or untrained, Southern African American women artists had to overcome extreme disadvantages in order to create art. Furthermore, the American South looms over their artwork: the rich and complex cultural and historical dynamics of Southern life are manifested in subject matter, medium, and even reception by the art world. In considering artists such as Alma Thomas (1891-1978), Selma Burke (1900-1995), and Augusta Savage (1892-1962)—alongside Evans, Hunter, and others—this essay seeks to explore their similar struggles, their connections to the American South, and their range of creative expression.